I can’t say it enough: I love meat. The pink, the red, the white stuff, I’ll devour it all. If I grew up in China, IF, I’d probably eat dogs, too. Then again, I was born and raised in Europe and yet never ate a horse (at least not to my knowledge). Though horse meat was readily available to its enthusiasts (were they? ), it just never sounded good. Maybe it had something to do with the fact that, when I was in my teens, my room was plastered, floor to ceiling, with posters of horses, plus an occasional image of Patrick Swayze and Mel Gibson (the real life mad man turns out) tucked in between. Maybe Mel Gibson ate horses? Or dogs?? I watched this video today, made by a very cool organization called GOOD, where I heard it again: meat production creates three times the green house gas emission as veggies, eggs, grains, or fish. The video is not a dooming project, it’s educational. See what small changes you can adopt in your every day living that will help not only to save you BIG BUCKS but also contribute to global energy savings and thus help protect our motherland. When you go grocery shopping this weekend, plan your menu for your next Meatless Monday. You’ll find countless ideas for satisfying and nutrient-dense meals made with no meat on the pages of yours truly (ONE MORE BITE). For a quick reference, however, I’ll throw in another one today. This is one of those dishes I actually don’t plan for. Funny enough, the only ones I do are those meat-heavy platters. Every week I get a variety of vegetables, whatever calls my name and with no agenda. Around 4 PM on a mid week day I enter the kitchen and poke my head into the refrigerator trying to figure out what to make for dinner. Slowly, one by one, I begin to pull out various greens and land them on the kitchen counter. Next, I go through the pantry cabinet and look for grains or pastas, beans, nuts, dried fruit, canned anchovies, tomato paste, etc. From a basket in the corner I grab an onion or a couple of shallots, a head of garlic, maybe a couple of potatoes. At this point, while I may look calm and relaxed on the outside, in my head I undergo a violent and calorie-consuming brainstorm. Within minutes my kitchen turns into a mad scientist’s lab with lights blinking, cupboard doors slamming, windows shattering, and other inexplicable explosions visible on the horizon. Half an hour or so later I come out, as if nothing ever happened, with a complete dinner, plated and all. It’s as easy as cooking rice and adding to it a handful of frozen edamame beans minutes before its done. It’s as easy as finely chopping a shallot, garlic and chili pepper and tossing them together on a hot pan with a touch of olive oil and a handful of almonds. It’s as easy as parboiling string beans and florets of broccoli in salted water and then adding those guys to the pan with the nuts. Drop in a handful of sweat peas, drizzle with soy sauce, rice wine vinegar or lime juice, even a touch of honey. Serve over the rice, garnish with fresh herbs and sprouts of any kind, and ENJOY immediately. I guarantee, you won’t even notice there was no meat on the plate. Some days, when a special someone, like my friend Tamara who also happens to be an incredibly knowledgable and skilled acupuncturist (she’s funny, too! ), comes over for dinner, I think things through and prep ahead. She follows what I call a relaxed vegan diet. Her household is free of animal products, however when out and about she will occasionally enjoy a piece of cheese, or pastry. She lives her life labels-free, thus allowing herself to be mostly content with what is, rather than stressed out with what’s not. I admire that quality in her as it’s not as easy to attain as it is to write about it. We ate together last night, and I wanted to celebrate her joy de vivre by creating a dish bursting with flavors, textures, and colors, while respecting her vegan preference. Hence, I juxtaposed dark Mahogany rice with roasted peanuts and basil oil (all sunk in) against white and raw celeriac salad with walnuts and creamy sunflower seed vinaigrette. On a bed of bright orange sweet potato mash I laid green zucchini and bok choy, plus a handful of garbanzo beans made Southern style (meaning fried). To add texture I sprinkled nutty hemp seeds over the rice and red teardrops of pomegranate seeds all over the plate. A couple of edamame beans delivered another building block of protein, and made the meal complete. Cooking is fun, especially when you think outside of the box and keep reinventing yourself. Mother Nature gifted us with thousands of incredible varieties of edible plants. Whether you like them raw, cooked, dehydrated, even fried (however rarely), chances are you’ll never get bored with them. So get jiggy with it! Guess what, no animal was harmed in the process of writing this post. On the contrary, Cosmo napped on my lap all along with my left hand scratching his ear while the right one typed each letter o n e b y o n e.
Also, for the record, I would never EVER bite a dog. Not even a hot-dog. That in a nutshell is Gordon Ramsay’s show THE F WORD that I’ve discovered recently on BBC. Despite all the above I got hooked. I tivo and watch every episode. Sometimes more than once. Not only have I grown to like Gordon, and I mean I really really like him, but also I find myself snapping the back of my right hand against my left palm when making a point. Call me Ramsay. Clearly, I had to share my enthusiasm with someone. Hence I force-fed Jason THE F WORD (f for food, hopefully). 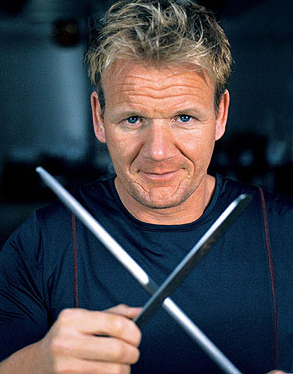 After initial strong resistance, finally he also admitted chef Ramsay was highly entertaining. The show is different. It is British after all. What I like the most, however, are Gordon Ramsay’s recipes he shares on the screen. All of you who have been following me on these pages know I don’t cook much red meat or pork. The consumption of meat especially in this country is through the roof these days severely affecting the balance in Nature and more directly our health. I do use pancetta; little bits and pieces of that Italian bacon are enough to add a depth of flavor to any given dish without the need to eat half a pig at one sitting. This may have been the third time over two years that I cooked pork for dinner. It only shows you how enticing the food made by chef Ramsay is. Below, I retraced the steps Gordon commanded me to take when making his pork chops with crashed sweet potatoes. 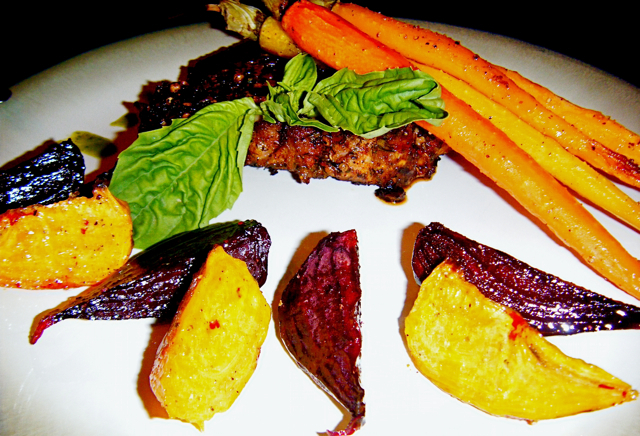 My twist are the roasted beets and carrots. Voila! Mix all the components and spread all over the pork chops. (When buying the meat, choose the kind on the bone. Ask the butcher to expose the bone for you. Not only the pork chop has a more dramatic effect when plated, but also baking meat on the bone assures for a moist and flavorful dish.) Cover that with a plastic wrap and chill in a refrigerator for minimum 2 hours. When ready, take the pork chops out, heat a little olive oil in an ovenproof skillet and add your meat. You want to color the chops on each side and then bring the whole skillet to a preheated (400°) oven for 8-10 minutes. Take the meat out and rest for 10-15 minutes in order to let all the juices get back inside the meat. If you were to cut it right away, all that nectar would seep out onto your plate leaving the chops dry and utterly depressed. 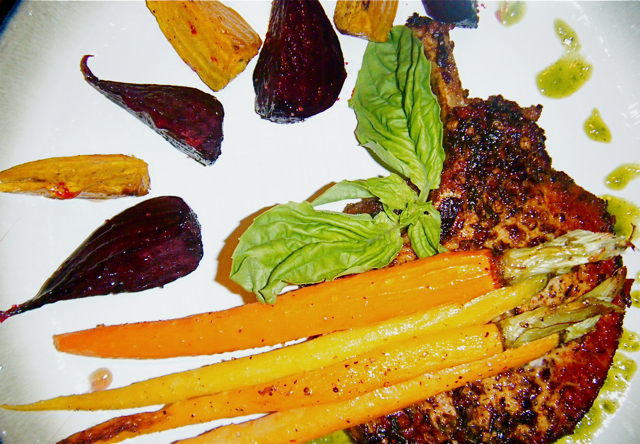 While the pork chops relax on the side, into the same hot oven slide a tray with peeled and quartered beets. Make sure that they are seasoned with salt and pepper and moistened with olive oil before you sent them in! Half an hour to 40 minutes should do the trick. You can add spice to your meal by adding a drizzle of Balsamic Vinaigrette, or Basil Vinaigrette. Let the flavors and colors of fresh produce bring your dish to live. If it looks appetizing, followed by a great taste, even your child (or your sister’s) will devour the veggies just as fast as the meat. In other words, no one’s safe around GOOD & HEALTHY FOOD. Eating habits, limitations, mental blocks dissipate when one’s nostrils get teased with the meal’s aroma. A beautiful arrangement of elements on a plate tempts the eyes. The hands will resist no longer and bring a bite to the deprived mouth. There’s no turning back from here. Welcome to my Heaven. Make yourself at home, my friend. It was a long holiday weekend with a rainbow of flavors and events from the Pork Loin Wrapped In Bacon, to Experimental Mashed Rutabaga & Cauliflower, to Butternut Squash Ravioli, to couples’ massages in Ojai, to the golden sunset over an orange orchard, to my virgin Lucky Devil’s Kobe Burger, to a kaleidoscope of hungry friends taking turns in our dining room, to the beheaded pigeon in the courtyard of our building. Need I say more? The pigeon incident was not only utterly sad, but also eerie. Last night I was leafing through the Jamie Oliver’s cookbook “Jamie at Home”, looking for dinner inspirations for the upcoming week. There’s a whole section on feathered game in the book, and I happened to put my finger on the page 262 with the recipe for an Asian-style crispy pigeon with a sweet and sour dipping sauce. It was so outside of my culinary box, I handed the book over to Jason asking for his impressions, and thinking to myself “How does one even go about getting a pigeon?” This morning I found one, lifeless, headless, footless, right outside our kitchen window. It was heartbreaking and creepy all at once. I have chills rushing down my spine even now, as I’m typing these words. Urgh! Those wild cats that roam the streets of the city at night! Then again, there’s no reason to reason with Nature about the shape and form of the food chain established over the millions of years of evolution. Happy thoughts, happy images, quick, take me to my happy place…Now! We drove to Ojai to steal a day outside of LA (I’m such a poet). We left to catch a breath of fresh air and to remember why we had chosen to live in California. 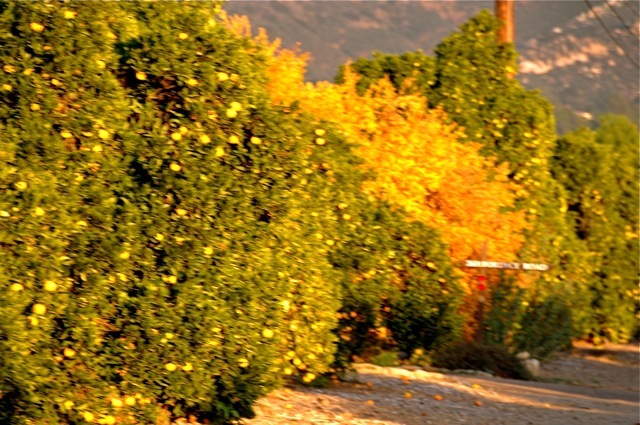 After each of us got a bottle of body oil rubbed into their skin from heads to toes (just like the herbal and honey-mustard mixture I massaged into the piece of pig we ate on Thanksgiving), we cruised the outskirts of that little town, surrounded by orange trees pregnant with fruit and kissed good-night by the last rays of sun. There was silence in the air, and we could feel the heartbeat of the Earth beneath our feet. The living painting all around us was simply astounding. The Earth… the Mother, the Miracle, the Might, the Beauty… Let’s not destroy it… please. 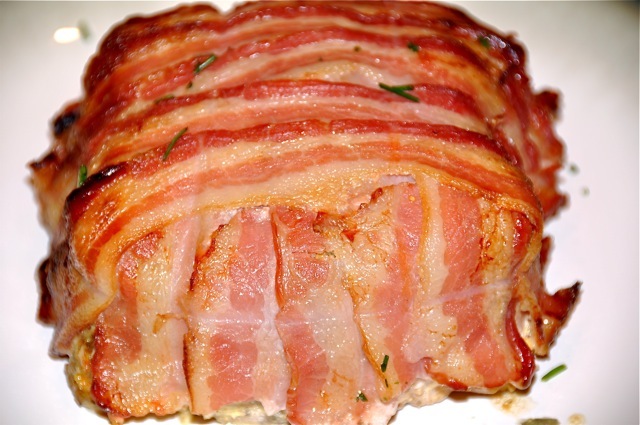 If you are aching for baking… a little pork, here’s what needs to be done for this dish. Mix all the above listed ingredients in a bowl and set the sauce aside. Heat the oven to 350˚. 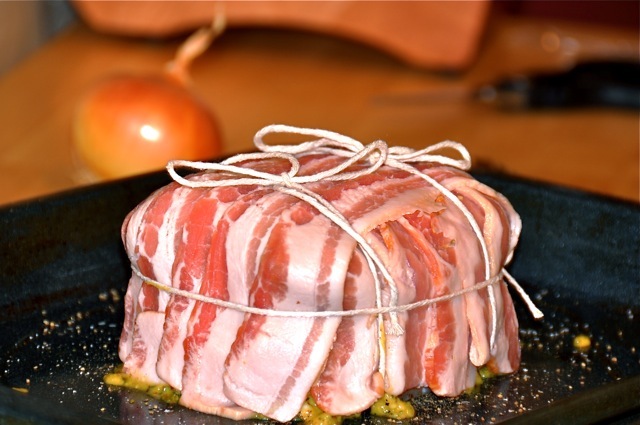 Cut three pieces of kitchen twine, long enough to wrap around your pork loin and tie. Lay them across your baking pan, and set the meat on top of the strings. Sprinkle salt and pepper all around it, but gently. Using a spoon spread the honey-mustard mixture all around the chunk of pork. Now, take two bacon strips at a time and overlap them as you cover the whole piece of pig in the dish. Tie the kitchen twine, and shove it al into your preheated oven for about an hour. When you take the meat out, wrap it with a sheet of tin foil and give it 20 minutes to let the pork get to its happy place. You never want to cut into the meat instantly after cooking. Let it rest. The juices will then distribute within the chunk, thus keeping it moist and utterly flavorful. Our pig was really happy, particularly because we served it with a side of simple green beans. I’ll give you a few tips on how to make the beans exciting and bursting with life. 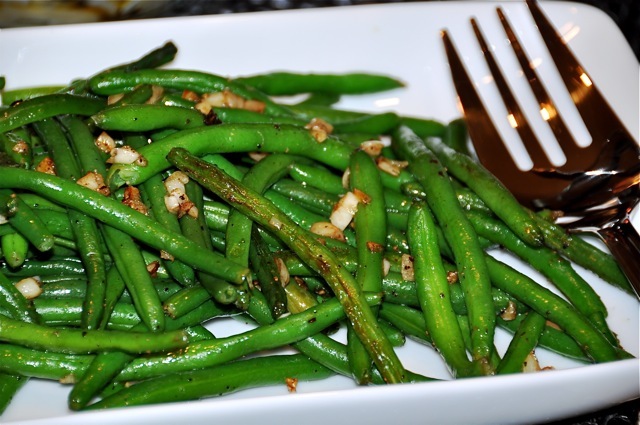 Toss your green beans into a pot with salted boiling water and let them cook for about 2 minutes. Then whisk them out and throw them directly into a bowl of ice water. In other words, shock them! There’s no need (nor reason) to hide and then jump and scream “Surprise!” while at the task. The ice water will do the trick. Basically, you want to stop the cooking process, and also allow the beans to retain their vibrant color. Drain the veg and now toss it onto a hot skillet with a tablespoon or so of melted butter, add a couple of roughly chopped garlic cloves, sprinkle with salt and pepper, maybe a few red pepper flakes for that extra kick, and toss everybody around for a couple of minutes over medium-low heat. Another miracle of the day was my Experimental Mashed Rutabaga and Cauliflower. It was a truly unexpected success. I will tell you all about it in my next installment. Stay tuned.